Pedax introduces a new generation of Metax bar cutting machines optimised for shorter cutting times, better performance and lower energy consumption. 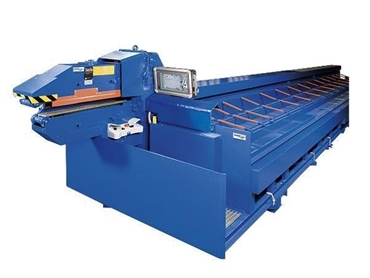 In the market for over 30 years, Metax multibar cutting machines not only deliver a strong output and high durability but also feature an unbeatable measuring and pull-in feeding system that works without stops to guarantee great flexibility, fast acceleration and exact cutting lengths over the entire measuring range. Metax bar cutting machines are built with two or three conveyors and, on request, with an additional collecting and transport channel. The new generation Metax GXE/GXN multibar cutting machines from Pedax is now equipped with special hydraulics featuring speed-variable pump drives; the hydraulics only run when the machine is working with the required power only then called up. Key advantages of Metax GXE/GXN multibar cutting machines include: up to 80% less energy costs; shorter cutting times due to diameter-specific cutting and increased stroke speed; increased measuring accuracy with length accuracy of ±0.5 cm throughout the whole measurement range; less noise during the working process; less oil consumption due to a modern, improved filtration system; and shorter cycle times thanks to optimised interaction of the processes. Metax multibar cutting machines are available from Precision Metal Group .